Ben Foster, Jesse Plemons and Chris O’Dowd star in the Lance Armstrong biopic, The Program. 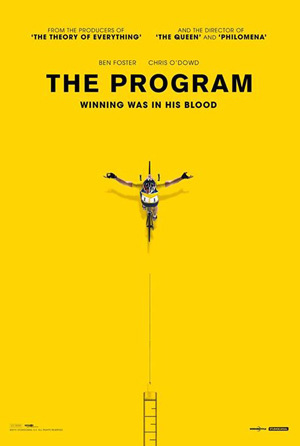 Watch 'The Program' trailer below. The drama recounts the meteoric rise and fall of controversial professional cyclist Lance Armstrong. The true story of the meteoric rise and fall of one of the most celebrated and controversial men in recent history, Lance Armstrong. Based on the award winning book ‘Seven Deadly Sins’ by David Walsh, and featuring a stellar cast including Ben Foster, Chris O’Dowd, Guillaume Canet (Tell No One) and Jesse Plemons (Breaking Bad), ‘The Program’ looks at how one of the greatest deceptions in the modern era was uncovered while Armstrong convinced the world he was a hero, winning the Tour de France seven times.